I spent this past weekend backpacking in Rocky Mountain National Park, where although the snow-swept peaks and the dangerously close wildlife were staggering, the night sky stood in triumph. Without a fire, the stars, a few planets, and the surprisingly bright Milky Way provided the only light to guide our way. But the night sky as seen by the human eye is relatively dark. Little visible light stretching across the cosmos from stars, nebulae, and galaxies actually reaches Earth. The entire night sky as seen by an X-ray detector, however, glows faintly. The origins of the soft X-ray glow permeating the sky have been highly debated for the past 50 years. But new findings show that it comes from both inside and outside the Solar System. Decades of mapping the sky in X-rays with energies around 250 electron volts — about 100 times the energy of visible light — revealed soft emission across the sky. And astronomers have long searched for its source. At first, astronomers proposed a “local hot bubble” of gas — likely carved by a nearby supernova explosion during the past 20 million years — to explain the X-ray background. Improved measurements made it increasingly clear that the Sun resides in a region where interstellar gas is unusually sparse. But the local bubble explanation was challenged when astronomers realized that comets were an unexpected source of soft X-rays. In fact, this process, known as solar wind charge exchange, can occur anywhere atoms interact with solar wind ions. After this discovery, astronomers turned their eyes to within the Solar System and began to wonder whether the X-ray background might be produced by the ionized particles in the solar wind colliding with diffuse interplanetary gas. In order to solve the outstanding mystery, a team of astronomers led by Massimilliano Galeazzi from the University of Miami developed an X-ray instrument capable of taking the necessary measurements. Galeazzi and colleagues rebuilt, tested, calibrated, and adapted X-ray detectors originally designed by the University of Wisconsin and flown on sounding rockets in the 1970s. The mission was named DXL, for Diffuse X-ray emission from the Local Galaxy. On Dec. 12, 2012, DXL launched from the White Sands Missile Range in New Mexico atop a NASA Black Brant IX sounding rocket. It reached a peak altitude of 160 miles and spent a total of five minutes above Earth’s atmosphere. 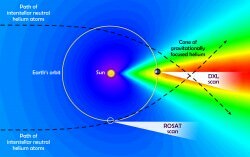 The data collected show that the emission is dominated by the local hot bubble, with, at most, 40 percent originating from within the Solar System. It’s now clear that the Solar System is currently passing through a small cloud of cold interstellar gas as it moves through the Milky Way. The cloud’s neutral hydrogen and helium atoms stream through the Solar System at about 56,000 mph (90,000 km/h). The hydrogen atoms quickly ionize, but the helium atoms travel at a path largely governed by the Sun’s gravity. This creates a helium focusing cone — a breeze focused downstream from the Sun — with a much greater density of neutral atoms. These easily collide with solar wind ions and emit soft X-rays. The confirmation of the local hot bubble is a significant development in our understanding of the interstellar medium, which is crucial for understanding star formation and galaxy evolution.